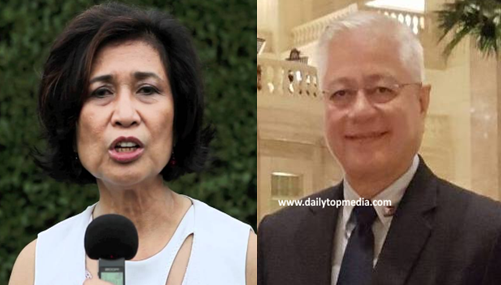 According to former Interior Secretary Rafael Alunan, he wants sedition charges against any person, foreign or local who plans to oust President Rodrigo Duterte as a President. In his Facebook post, Mr. Alunan noted that he warns those persons involved to be declared persona non-grata. The netizens reacts on his posts, they speculate that Alunan is referring to number one supporters of Mar Roxas, Loida Nicolas-Lewis. The former senatorial candidate did not directly name the person involved. Recently, after Vice President Leni Robredo resignation as chairperson of HUDCC, Mrs. Lewis called for the resignation of President Duterte. MEDDLERS SHOULD TAKE NOTE. STUPIDITY IS NOT AN OPTION. Any person, foreign or local, engaged in SEDITION carries penalties in the Revised Penal Code. A dual citizen inciting abroad breaks new ground. If legally feasible, a case could be filed in the host country, win it there, then seek extradition (if a treaty exists). Pending that, a cancellation of the privilege could be one immediate action as well as declaring the offender/s "persona non grata." The DFA, DOJ and Congress should look into the various options to deal with offensive persons used to "having their cake and eating it too." People like that reflect the culture of entitlement and impunity gripping the country causing the great divide between haves and have-nots; the "1%" and the "99%"; those who rule BY law and those who thirst for the rule OF law. They must go if the Philippines is to flourish. To despoil, for any political or social end, any person, municipality or province, or the National Government of all its property or any party thereof. ART. 140. Penalty for Sedition. - The leader of a sedition shall suffer the penalty of prision mayor in its minimum period and a fine not exceeding 10,000 pesos. Other persons participating therein shall suffer the penalty of prision correccional in its maximum period and a fine not exceeding 5,000 pesos. ART. 141. Conspiracy to commit sedition. - Persons conspiring the commit the crime of sedition shall be punished by prision correccional in its medium period and a fine not exceeding 2,000 pesos. ART. 142. Inciting to Sedition. - The penalty of prision correctional in its maximum period and a fine not exceeding 2,000 pesos shall be imposed upon any person who, without taking any direct part in the crime of sedition, should incite others to the accomplishment of any of the acts which constitute sedition, by means of speeches, proclamations, writings, emblems, cartoons, banners, or other representations tending to the same end, or upon any person or persons who shall utter seditious words or speeches, write, publish, or circulate scurrilous libels against the Republic of the Philippines or any of the duly constituted authorities thereof, or which tend to disturb or obstruct any lawful officer in executing the functions of his office, or which tend to instigate others to cabal and meet together for unlawful purposes, or which suggest or incite people against the lawful authorities or to disturb the peace of the community, the safety and order of the Government, or who shall knowingly conceal such evil practices.